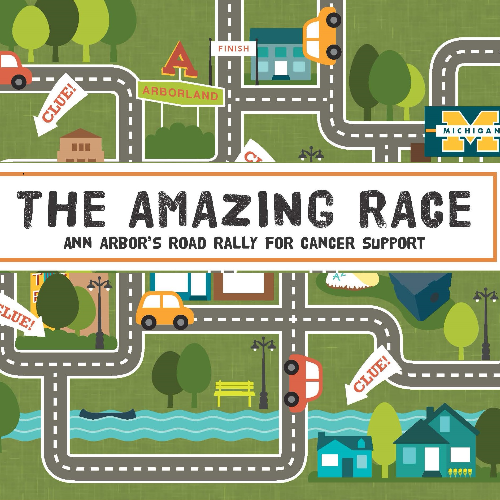 The Cancer Support Community of Greater Ann Arbor (CSC) will host its Tenth Annual Amazing Race on April 27th, 2019 .One of CSC’s largest yearly fundraisers, the Amazing Race is a family friendly Ann Arbor-based driving scavenger hunt, where teams of four people solve clues, hunt for hidden locations and landmarks throughout town, and compete to be the first team complete the course. One of CSC’s largest yearly fundraisers, the Amazing Race is an family friendly Ann Arbor-based driving scavenger hunt, where teams of four people solve clues, hunt for hidden locations and landmarks throughout town, and compete to be the first team to complete the course. It’s a great adventure that is fun for all ages! This year's Honorary Chair is Jamie Guise and the event is presented by The Juergens Nolan Mattson Group, Merrill Lynch, St. Joseph Mercy Health System, and University of Michigan Rogel Cancer Center. The race begins at Atria Business Park on Hogback Road at 4:00 pm. A post-race party at 7:00 includes refreshments, food, entertainment and prizes. Are there ID requirements or an age restriction to enter the event? There is not an age restriction to the event. However, IDs will be checked for alcohol consumption. We will be sending out additional information regarding this to your email address provided the week before the event. You will need one working vehicle per a team and at least two able bodied people who is able to get in and out of the vehicle to complete clue tasks. Tickets are $50 per person and include participation in the road rally and food at the post party. Teams of four are highly encouraged. You do not. By purchasing your ticket on A2Tix, you are automatically registered.